Relaxing by the beach, a cocktail by the pool, room service, it’s the time of year to book your summer holiday. But what if this year you were to do it different? What if your holiday didn’t involve a plane but a car trip to North Wales. North Wales vs the sunny beaches of Kefalonia?! I know it sounds silly but hear me out on this one. My love of the great outdoors stems from trips to army camp when I was a teenager. We travelled from our school in the North East of England to the Lakes. We climbed to the top of a mountain - I had never been so high or seen so far. Rode mountain bikes across wild terrain and main roads thinking I’d never been so fast or had never had such a sore bottom but laughing the whole way. Camping with nature in such silence that all I could hear were the sounds of owls (of which I had never heard before) and some other noises which I couldn’t quite decipher! Walking with a torch and seeing toads jumping everywhere was also a new one! I remember never being bored, beans, sausages and bacon tasted so amazing and feeling so happily exhaustedly tired, snuggled in a dorm of friends. As we grow older we tend to forget about the small things. Like the smell of bacon frying in the morning at a campsite. The feeling of walking for miles, breathing in the fresh air, stopping for picnic’s and feeling so blissfully tired. Instead of booking the usual foreign summer holiday, why not reshuffle the pack and choose something completely different. For your children, there is no place like Snowdonia for their first outdoor adventure and Crashpad Lodges is no better place. You can hear the Owls, wish upon a star, there’s plenty to choose from! Build a camp fire and tell some ghosts stories. Let them make dens and learn about off-grid living - Josh will be more than happy to chat all about how Crashpad Lodges is running on sun, wind and water. And the lodge is situated on a farm ran by a lovely Welsh farming family and occasionally you can see the sheep being herded by Welsh Collies – it is amazing to watch. For us adults, most of us will have climbed a mountain and rode a mountain bike by now but what about paddle boarding, para-gliding, venturing down a copper mine, abseiling or scuba diving? Just pop us an email if you would like to us to help set up activities, we have many good connections to local outdoor companies who can show you a great time. For you and your friends, there is no better place than Crashpad to get that childhood thrill of new experiences, re-live those fond outdoor memories and get back to basics. For every set of guests who stay at Crashpad we will now be providing a disposable 35mm film camera. You will have to swear a *Crashpad Oath to print them out, now that’s an experience you may not have done since you were small! Josh’s number to chat everything Crashpad and what to do in Snowdonia is or ping him an email on. *Crashpad Oath. 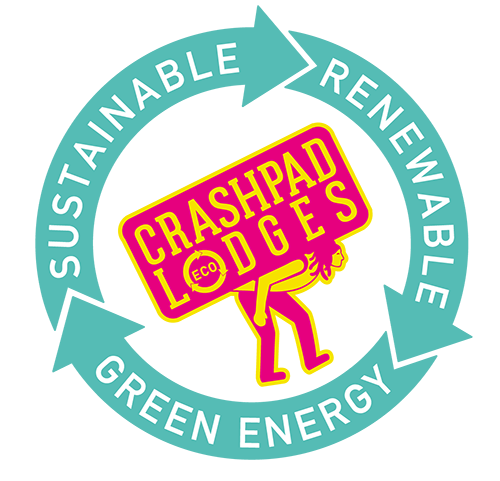 Once you have stayed at Crashpad Lodges you will become a “Crasher” and forever a guardian of the Lodges.